Happy New Year from Moore Or Less Cooking! This is the first recipe on my blog for 2014! I am happy to post a very delicious and easy cookie bar to start the New Year off with sweet luck! 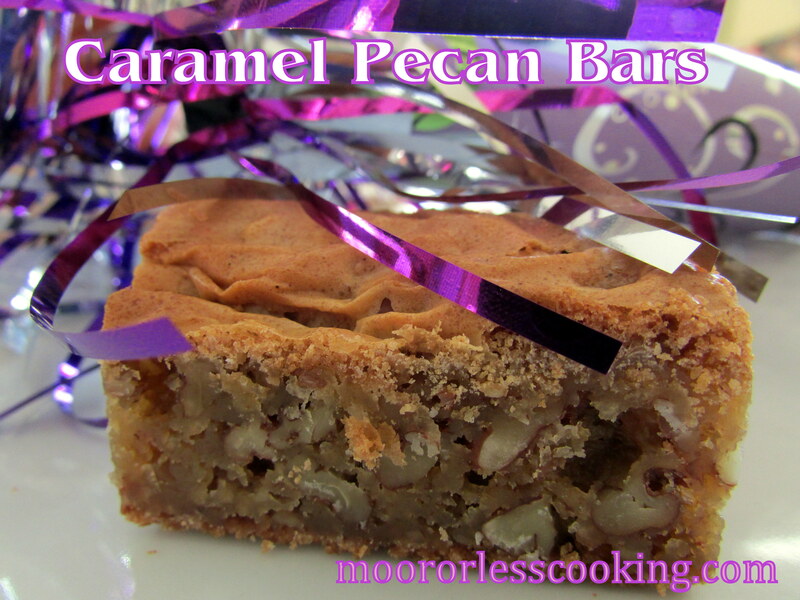 Thinking that we were eating lots of delicious lucky foods for New Years Day, I thought that this Caramel Pecan Bar would be perfect, it tastes like a pecan pie in a bar. As soon as friends took their first bite, they asked if this was posted on my blog! So here you go! My new favorite Caramel Pecan bar! I wish you all a Happy Healthy Prosperous New Year 2014! In a large saucepan, combine butter and brown sugar over medium heat until sugar is dissolved. In a small bowl, beat eggs and vanilla. Gradually add hot sugar mixture, stirring constantly. Combine flour and baking powder; gradually add to the butter mixture and mix well. Stir in pecans. Spread into a greased 13-in. x 9-in. baking pan. Bake at 350° for 20-25 minutes or until a toothpick inserted near the center comes out with moist crumbs and edges are crisp. Cool on a wire rack. Dust with confectioners’ sugar if desired. Cut into bars. Yield: 4 dozen. This recipe has been featured on these wonderful blogs! In a large saucepan, combine butter and sugar over medium heat until sugar is dissolved. Combine flour and baking powder; gradually add to the butter mixture and mix well. Spread into a greased 13 inch x 9 inch baking pan. Bake at 350 degrees for 20-25 minutes or until a toothpick inserted near the center comes out with moist crumbs and edges are crisp. I have this recipe on my blog also. These bars are AMAZING, I have been making them for years. Happy New Year! Look delicious and easy to make. Those look delicious! They’re on my must try list! Yes thank you, I would just love to have one of your Caramel Pecan Bars, it looks delicious. 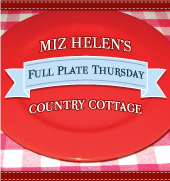 Thanks so much for bringing this awesome recipe to Full Plate Thursday today and have a great weekend! Thank you Miz Helen! Have a wonderful weekend!